If you were going to mix two stories, a zombie movie and Romeo and Juliet would probably not be your first pick. But somebody went and did that, and it works ridiculously well. In fact, it goes together so well that unless somebody points out what's happening, you could miss the fact that you're watching a mash-up movie. Warm Bodies tells the story of two star-crossed lovers with a wall between them. Literally, there's a giant wall meant to keep out the zombies. Julia lives on one side of it, because she's not a zombie, and R (that's as much of his name as he can remember) lives on the other side, because he is a zombie. Their two families - living humans and people who eat living humans - don't really get along. It seems like they are always fighting. One guy eats another guy's spleen, then the dead guy's cousin gets angry and shoots the first guy's brother in the face, and crazy feuds get started. And then, in the middle of all the mayhem, two young kids fall in love. 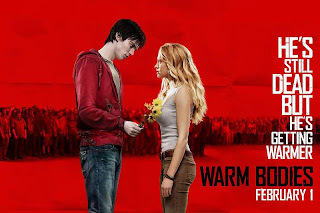 However, despite appearances, and the fact that a zombie love story is so ridiculous that it seems completely impossible, Warm Bodies is actually a fairly intriguing tale. It's full of romance and drama, action and tension. As Julia awakens feelings within R, he begins to return from his zombified state, becoming human again - and his brain-eating family doesn't think that's a good idea. If you're looking for a 'pure' zombie movie, you are obviously in the wrong place. It starts off with some pretty basic zombie stuff - shambling hordes, eating brains, and head shots - but then zombies start moving faster, and some turn into terrifyingly fast monsters who rip off their own skins, and the zombies talk to each other in short sentences. And, you know, they turn back into people. But breaking all the rules is the only way Warm Bodies ever could have worked. After all, a romance where a brainless, rotting monster has a romantic affair with a beautiful girl coasts a line between being silly and horrifyingly distasteful. So instead of having his skin hanging and guts dangling, R has some varicose veins in his neck and wacky eyeballs. These zombies are not as gross as the zombies you're used to seeing, and that's OK in this case because that's how the story works. And the story is actually quite good. When we realized halfway through that we were watching a Romeo and Juliet movie (watch for the balcony scene), I was suddenly a great deal more interested. I started getting a little nervous about the ending, because let's face it, Shakespeare's version doesn't have what would normally be called a happy ending. I won't spoil the ending, but I will say that it is executed very well. Get it? Executed? If Warm Bodies were just a zombie movie, it would still be pretty decent. It takes the traditional Romero zombie and flips it around a little to tell an interesting tale. Happily, though, it doesn't stop there, because layering classic Shakespeare over the top just makes it more intriguing. Yes, it's a little bit teen-romance. No, the acting is not incredible. But it's fun and campy and violent and exciting, and includes more than a couple cool surprises. I enjoyed it, and not just because I have a teenage daughter who loves any movie about young people in love. It was a surprisingly good movie. Take note that in the begging when R thinks about what the world must have been like before every person in the airport in his vision is plugged into electronics and doing the exact opposite of what he describes it must have been like. He imagined people interacting and expressing themselves. Instead they were already zombies. I did like that, but it didn't hit me particularly because Shawn of the Dead already did that bit, and did it better. Warm Bodies introduced a really great new direction in zombie movies, but I was glad they left the 'real live people are zombies' stuff for the first few minutes of the intro.